If you want to incorporate brick subtly into your garden design, there are definitely stylish ways of doing so. How about edging one of your flower beds with brick? This is a great way to add a sharp border at the point where your lawn meets your flowerbed, but which is soft and subtle enough not to overpower your whole garden with bricks. The brick edging can either be raised slightly to create an obvious boundary, or sunk flat into the ground if you really do want something completely subtle. 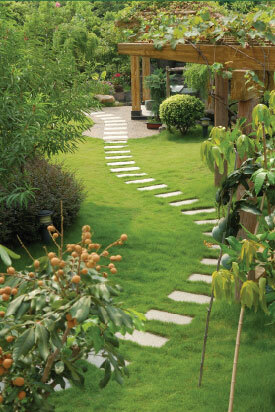 Speak to your garden landscape company about what would best suit your borders. Of course, you don’t just have to have a shallow brick edging to your flower borders. You can also create raised flowerbeds using bricks. These can be as high as you need them to be, although most people opt for about half a meter in height. If you need to terrace your garden or split levels, then obviously you can build the border – or retaining wall – as high as you need to go. Then run steps up the middle or along one side, and use bricks as balustrades either side. Remember to use brick colours which suit your style and your garden design. You may want something traditional such as bright red tones and make a bold statement, or alternatively you may prefer a softer yellowy colour which is rustic but gentle. Remember to choose a brick colour that complements any other hard landscaping, such as a patio, already in place. If you love the look of brick, then go big on brick! Create retaining walls around sunken patio areas, or if you entertain often, build a brick BBQ or opt for a trendy pizza oven. Speak to a professional garden landscape company to ensure that you don’t overdo the amount of brick in your garden and to ensure that it complements your planting scheme and overall design. If you’re looking to add some brick elements into your garden design, then why not get in contact with D&G Garden World? We are experts in garden design across Essex, with experience of landscaping gardens in Upminster, Brentwood, Orsett and Hornchurch.